American Sign Language is such a beautiful and fun language to learn but sometimes the routine of teaching students about grammar and phrases specific to the deaf community can be a bit dry. In classrooms we tend to follow routines so much we fall into a cycle and forget learning should be creative,interactive and fun (not always) but as much as possible. To do this, it is important to think outside of the box when teaching new information. So, I would like to share some of the games and ideas I use in the classroom. Also, the book in the picture is a great resource to use with a signing group or in a class. It has a little bit of everything that can be used to teach new topics, review topics, focus on fingerspelling, or numbers. When you have time check it out. 1. Sign Bingo: You can do this several ways: print out a bingo handout or make one or have students fold their papers into fours where it will give them four in a row or four down or four across. Then have students write in the current vocabulary you are learning without a free space or you can use one if you like but I like for students to review as many signs as you can. The teacher can sign the words to the students but I prefer to have students sign the words to get involved. Once a student has four in a row they must hit their desk and fingerspell BINGO to win! For winners I usually have a test pass as a reward that they can use to receive full points for a test and not have to take the test at all. Students are crazy-for that! This is another game that students give great feedback on. 2. I create flashcards using current and previous vocabulary words. Afterwards, students forms teams of five to six. Next, they line up in rows in front of the teacher. I show each student a flash card and they have 30 seconds or less depending on how good they are signing the vocabulary word to win a point for their team. The student at the beginning of the line tries first when finished they move to the end of the line and the next person moves forward for their turn, the students moves in a cycle. If they answer incorrectly they do not receive a point for the team. I do not allow them to ask for lifelines(help) but this game can be altered to play in any manner, if you do please share your new ideas with me:) The game makes a great review activity. I play several games in my classroom and am always looking for new ones. One of my greatest sources are games for ESL learners. 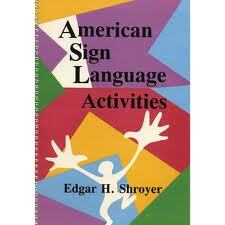 This selection of games, practice conversations and learning activities/handouts lend themselves well to ASL learning. Try it and let me know how it works out. If you are interested in additional activities please leave a message. Until then play, sign and be merry!